Some people think of the new automated economy in terrifying and mechanical terms. In such a vision, machines reign supreme as they work tirelessly, silently and efficiently to maximize production and replace humans. Increasing automation will soon put tens of millions out of work and change lives for the worst. Indeed, people matter little in this vast global machine of the coming economic era. This mechanical vision would be true (and incredibly boring) if all its components were machines. However, there is an advantage that comes from human nature that can make economy exciting, dynamic, and creative. 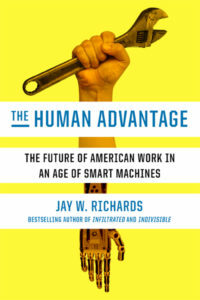 In his new book, The Human Advantage: The Future of American Work in an Age of Smart Machines, Dr. Jay W. Richards argues that machines need not prevail if this human advantage is maintained. The author does much to put the proper use of technology in focus. His historic perspective finds that similar problems existed in the past, although change came more slowly. He further shows how the war against progress being waged by today’s eco-liberals is really just a rehash of myths about capitalism, greed, and upward mobility, which he amply refutes. The key problem with today’s fast-paced economy is keeping it human. People must not succumb to the pull of materialism that seeks to turn them into machines, computers, or even algorithms. Keeping things human means not being enslaved by one’s passions and thus being truly free. When people exercise self-mastery, they will work together with new technologies, not against them. In this way, technology serves man and not the other way around. By keeping things entirely human and virtuous, Dr. Richards shows how everyone can exploit the human difference and do those things that only humans can do. The human ability to create and invent new things is one of these unique things. The fear of automation all too often corresponds to a lack of courage to find new and creative ways of doing things. Dr. Richards believes that Americans need to return to those skills of creativity, resilience, and empathy for the needs of others that they once practiced in the past. This return to creativity includes the courage to face failure and start over again. Pursuing the human advantages is not without its risks. Technology is a double-edged sword. 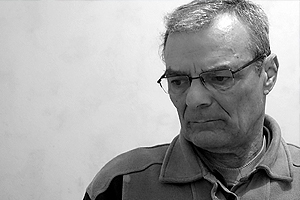 Dr. Richards warns that “Any tool that extends our power to connect and create can be used to divide and destroy.” The path ahead is not easy, considering the decay in society today. Indeed, there is nothing automatic or programmed about the free will. That same human advantage that makes a bright future possible can also cause its downfall. That is why culture matters and ultimately decides the future in the coming age of smart machines. 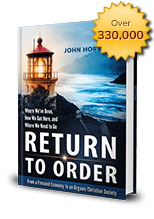 This entry was posted in Featured and tagged America, book review, economy, future, pursuit of happiness, smart machine, The Human Advantage, virtue, work by John Horvat II. Bookmark the permalink.